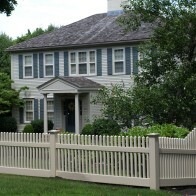 2 matching redwood nominal 10x10x60" fluted columns with pyramid post caps. 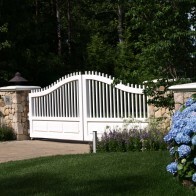 New England Woodworks, a driveway gate manufacturer, offers professional grade driveway gates, wooden driveway gates, wood driveway gates, and wood arbors are made of western red cedar, solid wood for lasting beauty and longevity for outdoor use. 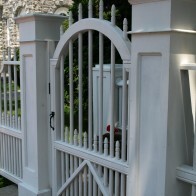 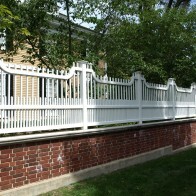 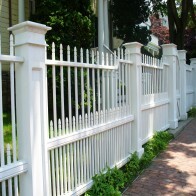 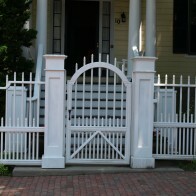 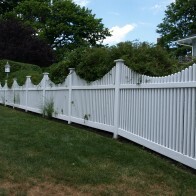 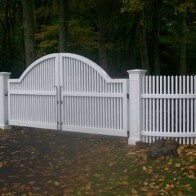 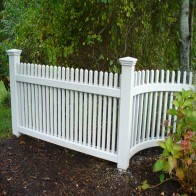 All driveway gates and wood arbors are traditional new england arbor designs. 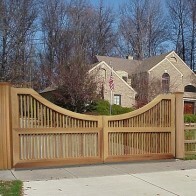 The driveway entrance gates, wooden arbors, and picket fences are all Amish quality crafted. 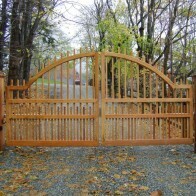 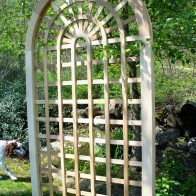 All driveway entry gates, cedar arbors and garden arbors are finely machined and finish sanded. 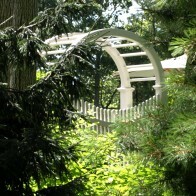 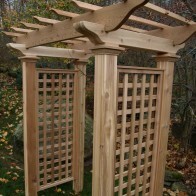 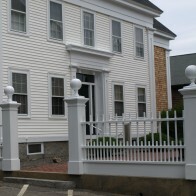 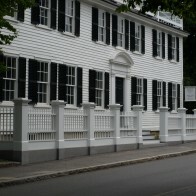 New England Woodworks offers the largest selection of professional grade cedar wood arbors, garden arbors, cedar walkway gates, cedar driveway gates, custom architectural cedar millwork, cedar lantern posts, cedar mailbox posts, custom cedar lattice works and decorative cedar and copper post caps. 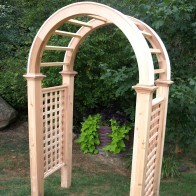 All arbors including our garden arbors come pre-sanded, ready to paint to any color desired and the hybrid option will finish identical to the entire arbor. 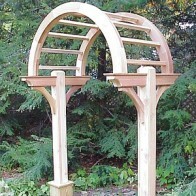 Our arbors are as sturdy and rigid as they are beautiful, all with 8ft. 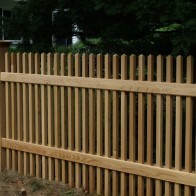 posts designed to go in the ground for the strongest of installations. 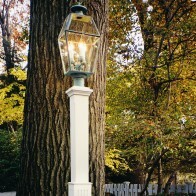 We have several methods to make these last a lifetime. 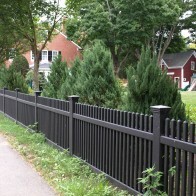 New England Woodworks primary ingredient has always been kiln dried fine textured western red cedar because of its inherent qualities; including dimensional stability, ease of machining to fine tolerances, excellent paint holding ability, longevity outdoors even in very harsh climates and Western Red Cedars incredible strength to to weight ratio. 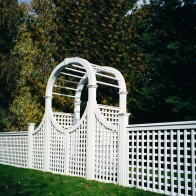 Components are also available, i.e. 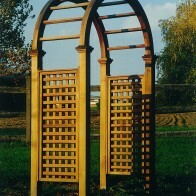 arch top only etc. 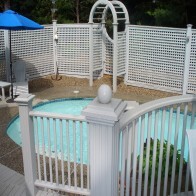 We highly recommend finishing our products with Sherwin Williams Duration Coatings due to the Lifetime Guarantee. 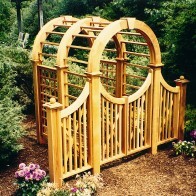 Please take the time to view all of our garden arbors, as we have an arbor to meet every architectural style, and if not we will build to your design. 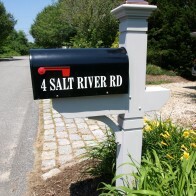 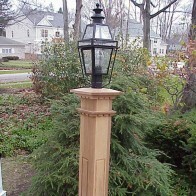 Check out our lantern posts and designer mailbox posts.